How Much Are Stair Lifts? Using the stairs can become a challenge when you become older or if you have a physical disability. Many people can’t live independently because of this and are forced to leave their home. To avoid this fate, you can purchase a stair lift for your home that will allow you to use the stairs with no help. Many people might shy away from this solution because of financial issues, but purchasing a stair lift is more affordable than you may think. Lower Costs Over Time. You are probably thinking, how much are stair lifts? Well, purchasing a new home that only has one floor or entering an assisted living community costs you hundreds of thousands of dollars over time. For a fraction of that price, you can stay in the home you already live in and have one of our stair lifts installed. On average, a straight track stair lift will cost between $1,500 and $8,000, depending on the model and distance. In comparison to buying a new home or paying rent at an assisted living community, a stair lift is astronomically cheaper. At Indy Stair Lifts we also offer discounts for veterans, used stair lifts, and a rental program for people on a tighter budget. Low Cost of Ownership. Another great thing about a stair lift is the low cost of ownership. They barely ever require maintenance and are inexpensive to use. At Indy Stair Lifts, our stair lifts use a rechargeable battery that plugs into a normal wall outlet. Our stair lifts are extremely efficient and do not require much energy to carry you up and down the stairs. A fully charged battery will provide you with up to 40 trips and will allow you to use your stair life anytime, even during a power outage. If you need a stair lift for a curved staircase, the price will be significantly higher. When a staircase is curved we need to create a custom track specific to your home. 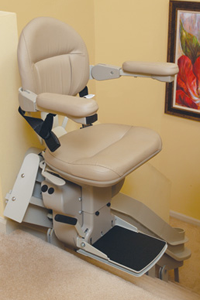 This can typically double or triple the price of the stair lift. Even with a higher price tag, it is still a cheaper alternative to moving into a new home or assisted living facility. After installing and using one of our stair lifts you will find that the luxury of staying in your home and living independently will prove priceless. You will be able to keep your freedom and maintain your mobility within your home with one of our stair lifts at Indy Stair Lifts.